A few crystallography forms have trioxide of arsenic. Among them two exist in nature: Arsenolite (cube) and claudetite (monoclinic). At the first crystals which can be seen with a naked eye are rare; it be found as earthy accumulations and crusts of light-gray and grey color. Klaudetit very looks like a gypsum and present as flexible plate tablet lamellar crystals. It is necessary to show a carefulness, because compounds of arsenic are poisonous. Arsenolite will dissolve in water. Arsenic oxide ore - a toxic metalloid element, existing in several allotropic forms, that occurs principally in realgar and orpiment and as the free element. It is used in transistors, lead-based alloys, and high-temperature brasses. Symbol: As; atomic no. : 33; atomic wt. : 74.92159; valency: -3, 0, +3, or +5; relative density: 5.73 (grey). Arsenolite, as well as claudetite, there is an oxidate different minerals of arsenic, foremost native arsenic and realgar. Arsenolite be found in many places, among them St. Mari-O-Man in Elzase, Lauta and Yoganngeorgenshtadt in Saxony, Sondalo in Valtellina and Borgofranko near Ivrea. 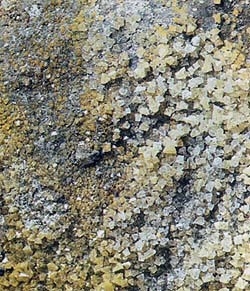 For claudetite the deposit of Semolnok (Hungary) and row of mineries is most typical from California to Arizona (USA).